Last I checked, this anime was available on DVD at this online store and this online store. In 192 U.C. (United Century), mankind is facing its very end. Orbital Ring System (ORS), the giant space base built around the orbit of Earth for space exploration, is captured by the unknown extra-terrestrial life form, "Radamu." Despite several attempts to re-captured the ORS, all failed. Mankind is virtually unable to defend themselves from the constant attacks by Radamu. Cities are destroyed, and the Earth seems doomed. But instead of destroying Earth completely, Radamu invades Earth by growing "plants" all over its surface, guarded by powerful cyborgs known as "Tekkaman." But the war is not over. 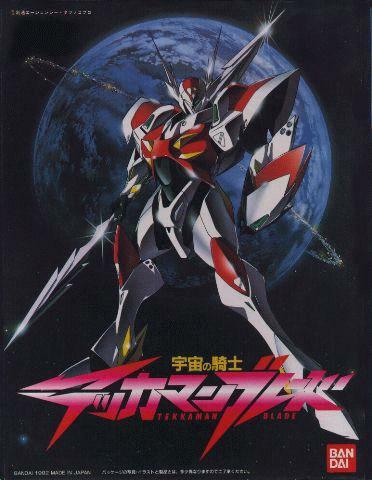 Tekkaman Blade is fighting for Earth. He was discovered by Aki and Noal, the members from Outer Space Agency. To their surprise, this mysterious warrior, fallen off from ORS, is actually a human being. Without any memory of himself, he is given the nickname "D-Boy" (Dangerous Boy). With his Radamu crystal, D-Boy can "transform" into Tekkaman Blade, giving him unprecedented power. So why is this Tekkaman willing to fight against Radamu to save mankind?! Side Note: While the series ended abruptly after 26 Episodes in the U.S., Teknoman (the Dubbed version) completed the show in its entirety in the European and Austrailian versions. However a few episodes were merged, ending it with 43 Episodes instead of the original 49 Episode run.